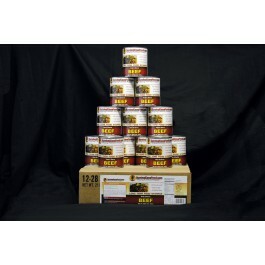 Survival Cave has put together this great pack of long lasting canned beef, which is ideal for any emergency situation. Each can contains 28 ounces, which adds up to a total of 108 total servings with each order. This is more than enough to keep your family full during most any type of disaster, especially if you have other foods available to supplement this meat. The meat is pre-cooked and ready to eat as soon as it arrives, or you can store it for 30+ years without it going bad. Order your emergency cans of beef today. Beef is a healthy meat that provides you with a variety of important nutrients, including lots of protein, which is very important during emergencies. 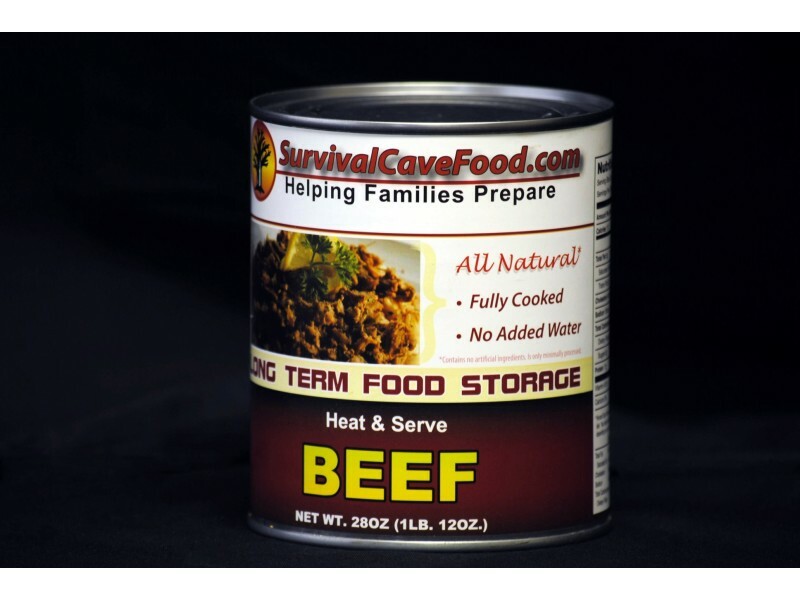 When you order this pack from Survival Cave, you’ll receive 12 full cans, each containing 28 ounces of high quality beef. The beef is pre-cooked by the professionals at survival cave to ensure that it tastes great, and also lasts a long time. It is then packaged in high quality cans, protecting the meat within from any contamination. 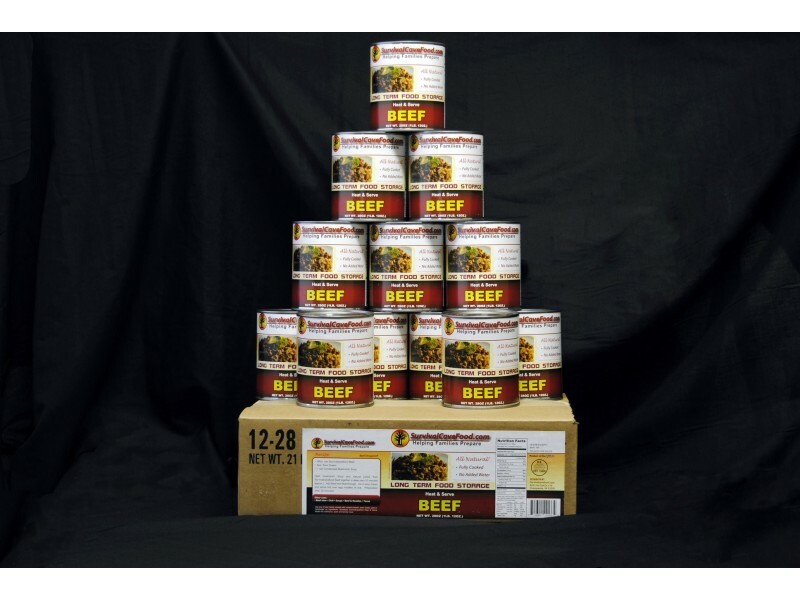 Whether you’re just starting your emergency food stockpile or you are just looking to make it a little bigger, this pack of 12 cans of beef is a great choice. 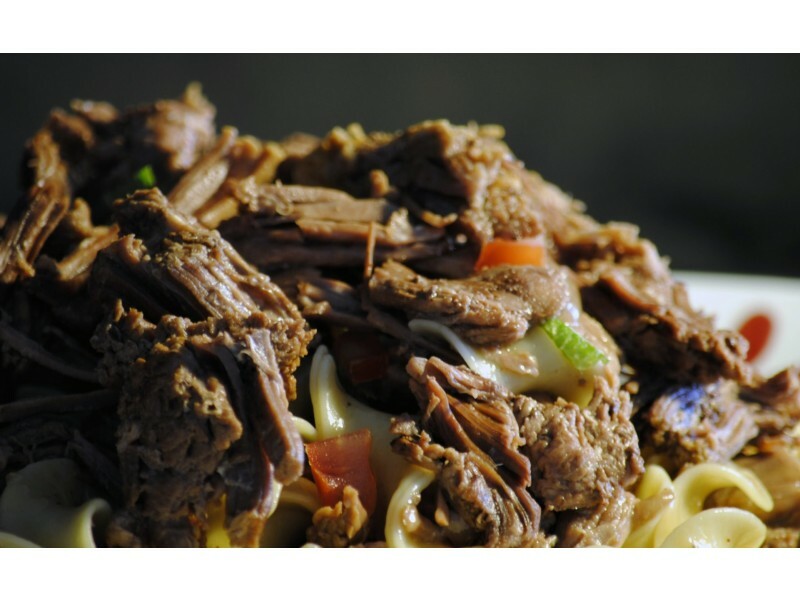 You and your family can eat the beef as it is, or add it to recipes, or serve it as part of a larger meal. However you choose to consume this great beef, you’ll surely enjoy the great taste, and appreciate the fact that you have the food you need. Protect yourself and your family from the risk of starvation, or having to eat unhealthy foods during an emergency. Stock up on this great item so you are ready for whatever life brings your way. Just how long will this canned meat last? Each of our canned meats are prepared in a very different technique than most canned meats available in the market. They are slow pressure cooked at a low 240 degrees and possess NO EXPIRATION date. A reasonable shelf life is about 12 -15 years but many people accept it may last 30 - 35 years or longer. You will get an overall total of 12 cans of beef with 28 ounces in each can for a total of 108 servings, no water or broth added in, simply the all-natural juices from the meat. That’s a full 21 pounds of fresh delicious wholesome hand packed and cooked meat. This delightful line of meats is prepared to give you the highest possible amount for your food dollar. They are simply hand packed and “non mechanically separated meats” and we NEVER ADD WATER or broth. This ensures that all you spend money on is meat. Whenever you open up these cans they are simply ready to consume and tasty in virtually any recipe you would use fresh cooked meat. Our canned storage meats are all natural and don't contain any Monosodium glutamate, artificial additives , fillers or chemical substances. They are lower sodium, low in fats and healthy and balanced for your family. USDA inspected Survival Cave Food canned meats are only made using 100% USDA inspected meats. Many other canned meats are foreign meats or state they are packaged in the USA although the meat in fact comes from other countries and are simply packaged in the United States. We only use 100% USA meats!